Is Terrorism Sweden’s New Export? 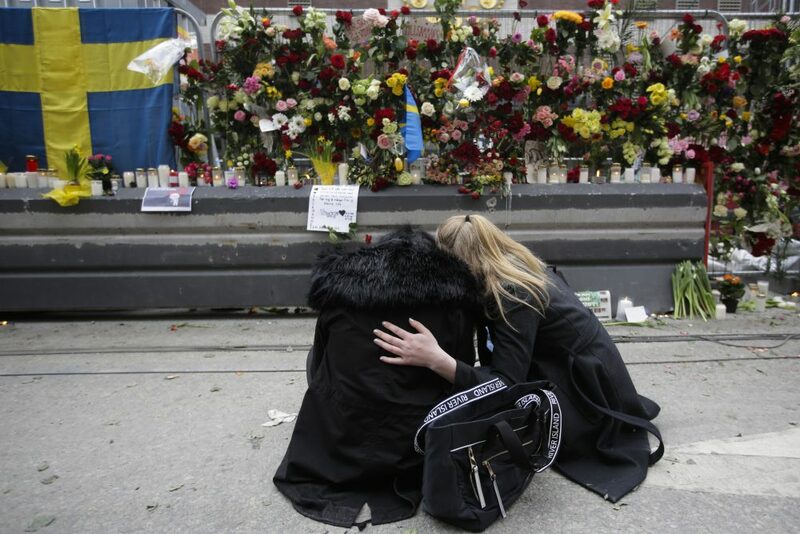 Women mourn at a flower-covered fence near the Ahlens department store following the April 7, 2017 suspected terror attack in central Stockholm. The suspect, Rakhmat Akilov, 39, who was born in Uzbekistan, drove a hijacked truck into a crowd of pedestrians, killing four and injuring 15 others. Uzbekistan’s foreign minister said the suspect had been recruited by the Islamic State. Photo by Markus Schreiber/Associated Press. There is a difference between knowing that Islamic terrorism could befall your country, and experiencing it. The April 7 truck attack in central Stockholm was experienced as a shock across the country. Our king even held one of his rare speeches to the nation. Some shock was understandable. But we should not have been surprised. For many years Sweden’s relative calm has disguised the fact that we are exporters of terrorism. More than 300 Swedish residents have traveled to join the Islamic State in Iraq and Syria—a high rate for a country of less than 10 million. But now that terror has struck mercilessly here at home, it clearly shows that even our country is a target for the terrorists. Neither Sweden nor any other open state can ever protect itself fully against terrorism. When terrorism strikes everyday lives—on sidewalks, in markets, inside a subway car, on a pedestrian street, as in Stockholm—it is meant not merely to kill but to spread fear and disruption. So it has been gratifying to see the thoughtfulness and solidarity that people in Sweden have shown each day since the attack. Under the hashtag #openstockholm on social media, people offered their homes to those who needed somewhere to sleep, or offered their cars to those who needed help with transportation as parts of the city shut down. The attack has fueled the debate in Sweden about how we can prevent terrorism and extremism here, a subject that is the focus of my own journalistic work. In comparison with other countries, Sweden has been late to tackle the problem and remains in an introductory phase. The public debate is sometimes very intense about which approach, hard or soft, is the best way to go. Should we, for instance, help those who want to leave the extremist networks with psychological support, or just imprison them and drop the keys? Among those who traveled from Sweden to the Islamic State, a great preponderance arrived in this country as young children and were raised here. They often are from low-income families and have been convicted of minor crimes. Most of them have grown up in segregated suburbs, where there are networks of Islamic radicals who seek to convert young people to extremist beliefs. Over many years, much of the society has been ignorant and naïve about this problem, failing to better integrate these suburbs and reach young people, or confront the radicals. To the contrary, some associations governed by Islamic radicals have received grants for their work. The April 7 truck attack was not our first brush with domestic Islamic terrorism. In 2010, in nearly the same place in Stockholm as the April 7 attack, 29-year-old Taimour Abdulwahab detonated a suicide bomb while standing amid holiday shoppers on Drottninggatan. Because of technical problems with the bomb, he failed to kill anyone but himself. What we know so far about the most recent attack is that 39-year-old Rakhmat Akilov from Uzbekistan was arrested on suspicion of driving the truck that mowed down and killed four people and injured many more. He has recognized the crime and, according to the police, he had shown sympathies for the Islamic state on his Facebook page. In many particulars, the attack fits a pattern we have seen over the past year in several European cities—including Nice, Berlin, and Paris—as the Islamic State has called upon its supporters in the West to use simple means (knives, guns, and vehicles) to attack the enemy. Sweden has failed to examine thoroughly the ideological environment that produces extremism, which has resulted in underestimating the extent of radicalization. The attitude has been that such problems don’t exist here, and that allegations against people are merely the product of racism and Islamophobia. The April 7 attack on Swedish soil may renew a debate about Sweden’s own experiences with terrorism. In recent years, the country has discussed how to stop people from Sweden who seek to plan and commit attacks elsewhere. Three people sit in jail for having been on the verge of staging a massacre of journalists at the Danish newspaper Jyllands-Posten in Copenhagen in 2011. Two others from Sweden, Mohamed Belkaid and Osama Krayem, were part of the terrorist cell that was behind the attacks in Paris in 2015 and Brussels in 2016. And, as mentioned previously, about 300 people have gone to fight in Syria and Iraq with about half of them returning home to Sweden. Though these returnees may pose a risk, the debate in Sweden in the weeks before the attack was over how to deal with them. In Sweden the law allows you to be a member of a terrorist organization if you do not participate in an attack or in war crimes. But that poses questions. What is the best approach to handling people who may be a risk, but are not breaking the law? How can local authorities obtain information from security officials about Islamic State returnees who may pose a threat, given the secrecy that surrounds terrorism and security investigation? And how does one conclusively prove what people may have done when they were in the Islamic state? These are not entirely new questions. Sweden has a history of harboring members of different terrorist organizations from other parts of the world; our commitments to fundamental laws of expression and assembly have made it possible for such organization members to engage in various forms of support for terrorist activities. In the 1990s, Sweden was home to cells linked to the Algerian group GIA (Groupe Islamique Arme), which spread propaganda and collected money here. Many of the Swedish members of the GIA traveled to Afghanistan to attend Al Qaeda training camps, and several residents of Sweden were suspected of involvement in various terrorist attacks in other countries. Some of these Swedish citizens later reached high positions in international terrorist networks. Among them was Mohamed Moummou, who became one of the top leaders of al-Qaida in Iraq, before he blew himself up during a firefight with the U.S. military in 2008. There also have been strong ties between militants of the Somali terror organization al-Shabaab and sympathizers in Sweden. Several senior leaders of the organization previously had operations in Sweden, among them Fuad Shangole and Abdulkadir Mumin. These bands helped several young Swedish Muslims join al-Shabaab in the mid-to-late 2000s. Sweden is hardly the only European country with small but active Islamist terrorist networks. And the pattern here is similar, with these networks concentrated in a few segregated suburban areas outside the major cities. But confronting the problem has been a bigger challenge here. In some cases, law enforcement authorities have sought convictions for terrorism financing, but have usually failed. There has been major skepticism of, and resistance to, the labeling of “terror cases” in Sweden, among some politicians, commentators, journalists, and human rights groups. Sweden has failed to examine thoroughly the ideological environment that produces extremism, which has resulted in underestimating the extent of radicalization. The attitude has been that such problems don’t exist here, and that allegations against people are merely the product of racism and Islamophobia. The attitude has changed somewhat since 2014, when the Islamic State expanded in Syria and Iraq. Media coverage and conversation have begun to focus on people in the country who support and sympathize with terrorism. But with Sweden seen as more exporter than importer of terrorism, for many the talk of an attack here felt hypothetical. That changed earlier this month when the war came to our streets. The discussion of how to deal with the continuing threat should dominate debate in Sweden for a long time to come. Magnus Sandelin is a journalist and author, active in Sweden. His latest book, from 2016, is about Swedes who join Islamic terror networks. extremism, Sweden, terrorism, Was Sweden Ever a Model Society?